Is religious training important to my child’s development, especially if I believe it’s important for my child to choose his or her own spiritual path in life? M: Yes, it is important. The child must be trained in the comparative understanding of religions and taught tolerance and acceptance of all paths. The child will then automatically grow up with an understanding of the parallel nature of the Inner Mysteries of different faiths. The child will also possess all the commonalities and know how to make an enlightened choice when he is ready. Teach him that it is the essence and not the dogma which matters. The child should never be made to feel obliged to follow the parents' Path. It must be exposed to it and made to feel like it is part of it, until such time as (through experience and experimentation) it can make an informed choice. It’s accepting difference and letting them explore that and making up their own minds that matters. You do not choose your child’s favourite colour. Understand and respect the fact that your child doesn’t have to be like you and share in your personal way of connecting spiritually. When they start to ask questions. For example, why do we celebrate why don’t we believe in Jesus? What is the Pentacle or the cross? How and when do you tackle that? M: We volunteered information right from the word go and through that encouraged questioning as he was growing up; we found it worked quite well, for us. A child must be part of everything in the household, the teaching, counselling session, as well as the ritual celebrations. Our son was given his name (shortly after birth), was breastfed and raised in circle, has been helping cast and run circles since the age of 3, has had his puberty rites done, but we believe that proper formal training should only start at the age of 15, should he have the propensity and the interest to continue on our path. What sort of information is appropriate for my child? M: Information is knowledge, knowledge is power. Provided the exposure to information is monitored by the parents, once the "Pagan imprinting" stages have successfully been accomplished, then all information is valuable. The child must be encouraged to develop its power of discernment and this will aid him/her to reach the conclusions which will help them connect on all levels. Remember, ignorance breeds fear and fear is false and debilitating. These limit the chances of your child blossoming to his fullest spiritual potential. Let go your own fears and accept that your child is an individual. Guide(especially when asked) but never prescribe choices or decision-making. Never criticize. Talk about the matter at hand openly; children listen and assimilate; later they ask questions and these questions always make one realize just how much they actually take in and how much of it they actually understand. You'll be surprised how much they pick up from just listening in ... try to ram it down their throats and they will reject it. My advice is, make Paganism and Environmental Action, recycling, an integral part of their daily lives and spirituality. 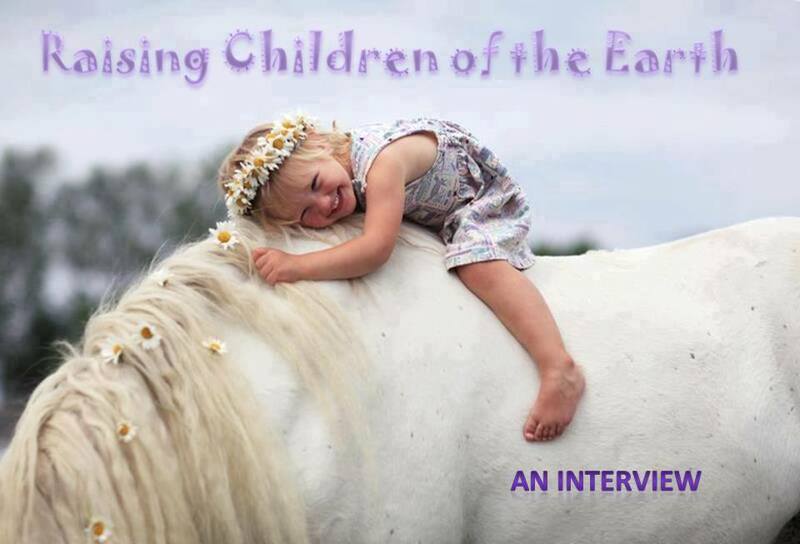 Children learn what they live. Teach them the "reduce, re-use and recycle" maxim. Lead by example. Take your child into Mother Nature and show him/her how to connect. Children who spend their lives indoors struggle to connect with the natural world as well as the fact that Nature needs to be protected. Get children to think about conscious energy use. Teach them where things come from. Teach them that Witchcraft is a religion filled with respect for Mother Earth as well as all the creatures which inhabit it. Include your child in everything you do, make the child feel at home, like he/she belongs. He must become familiar with everything that pertains to the Craft. Make it fun for him/her. Little by little. Easy does it. Start early, start young! Bear in mind that in the pre-school years children are extremely receptive and can learn the disciplines and necessary life skills, which include acceptable etiquette during ritual, social behaviour, meditation, etc. How do I honour my child's Will and Path and still parent in a Pagan way? Mja: Nothing can prevent you from guiding your child through life. Teach them that your reality is not the entire reality and assist them to eventually make an informed choice. We give our children the choice to choose what music they like best, what clothes they want to wear, what hobbies they prefer. Like with these mundane choices, we do not have to choose what arbitrary dogma they should ultimately follow. Know your child, love him/her, the rest will come naturally. By "know him" we mean understand his essence and do not attempt to change it into what you desire him to be. Always encourage him to do his best, to be himself and to trust you. Encourage him to speak to you about anything and everything, show interest in everything about him, listen and do not interrupt or jump to conclusions. Help him find solutions, but posing the options before him, however never forget to allow him to ultimately make the choices. Allow him to grow up and to be himself. Do not teach him guilt or fear. Do not try to control him through these negative-spectrum emotions. Teach him insight and tolerance. Children live in the moment, so teach them to look ahead in a loose way. Do not encourage the mounting of anxiety, for tomorrow is worth planning for, but largely dependent on the present moment and how that was lived. This distance from the past and the future, and focus on the NOW will empower our children with the ability to make easy transitions from one situation to another. Touch your child, be close to him, reassure him at all times that you are there to back up your words to him with action, if necessary, and redirect him when his behaviour is disruptive or not acceptable. Teach him to think positively by making positive affirmations (give praise where praise is due), by being a positive person whom he can learn from and want to emulate. Be supportive; guide him through the steps of every difficult routine, as well as choices, even if they be contrary to your personal choices. Give clear instructions explain and demonstrate and this will make it easier for them to comply, to adapt and to make their personal choices in a future. If we want to build our foundation on that of the old and to continue to grow, we have to be able to answer these and many more questions. Questions and answers will help build the future. What kind of future do you want to build for your faith? I ask that we deal with difference without bitterness or anger, that we not be rigid religious fanatics, but also let us not, in the name of inclusion and need for love, compromise the Old Ways into oblivion. Let us make sure that by the second or third generation, South African Pagans (including Christo-Pagans) will proudly celebrate the Magic of Midsummer in December, with Fire Parades through cities, song and plays, as well as be able to invite our Christian relatives to a Pagan Yule in the middle of Winter. Let acceptance and understanding be two-way roads and let everyone benefit from the Freedoms accorded us under the Constitution. Blessed Be our Children. Blessed be their feet and Blessed Be the Old Ways. Reference : interview to Morgause by Jacqui, in book Raising Pagan Children the Southern Way.